Skinner/Kirk dancers, burning it backwards in the ensemble's newest piece. 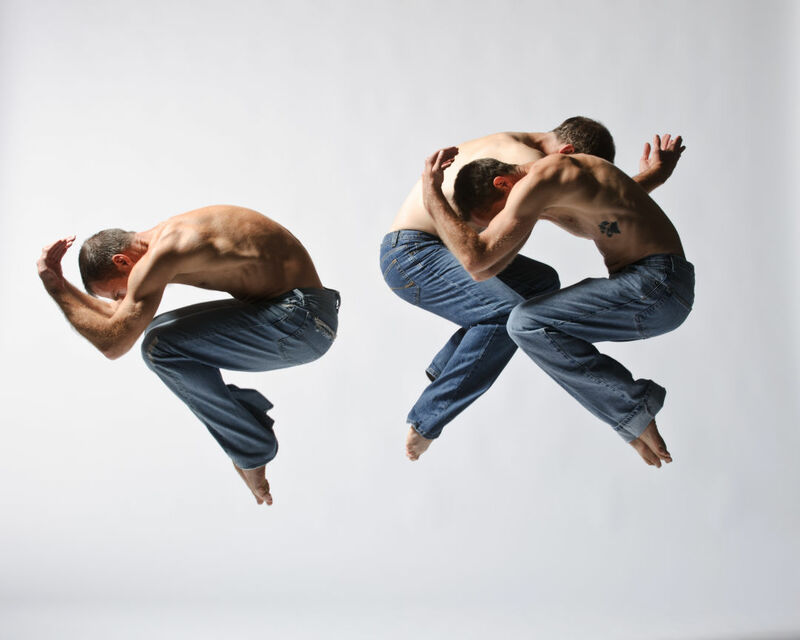 It isn’t difficult to see that Eric Skinner and Daniel Kirk have danced together for nearly three decades—from classical works as company members at Oregon Ballet Theatre and modernist flights of imagination at BodyVox to lush, muscular works for their own Skinner/Kirk Dance Ensemble. Aside from the talent and experience they each exude onstage, the pair of Portland-based choreographers seem to flow together, their movements coalescing into one. 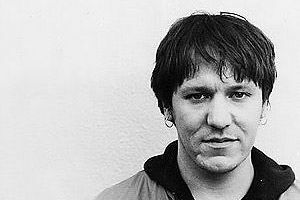 Skinner and Kirk's new show, Burn it Backwards, boasts another longtime local fixture: 13 songs by the late Elliott Smith, performed by a live band of local musicians. The piece’s name itself is borrowed from Smith’s song “Sweet Adeline.” Soundtracked by a carefully balanced mixture of lyrical and instrumental pieces, the five-man ensemble marries music and movement into an emotionally powerful union that explores themes of darkness and relationships. In advance of the show, which runs March 23–April 1 at BodyVox, we asked Skinner and Kirk a few questions dancing through our minds. What were your inspirations for this work? Daniel Kirk: We've been talking about using music by Elliott Smith for many years. We have this sort of orbit of connections to Elliott and his music. Elliott's life is dark and troubled. He came from a very dark place in his head, and if you pay attention to his lyrics you see that. It's painful. Our history is different than that, thankfully. So, rather than try to tell a biographical story of Elliott's life through his music, which is something we couldn't possibly understand, we decided to tell our own story using his music and lyrics as inspiration. Smith was from Portland. Was that another reason why you chose his music? Eric Skinner: Yeah, actually, we bought our house a while ago, and right around the time we moved in he [Elliott]—had either just moved out, or was there for a little bit—but he lived in a house right across the street from us. I don't think we ever met him, but we may have seen him. Then, after he passed away, his ashes were put in one of the rose gardens in Ladd's Addition, which is right across the street from where we live. So, there was that kind of synergy flowing around. Then, one of my best friends from when I was growing up brought up the fact that he represents Elliott's estate. There were all these really weird connections here and there that kept feeding into the kitty of doing this project... One of his parents still lives here in town—his father and his wife. They’re going to come to the show. What is the overall story, or message, of the piece? DK: Generally, Eric and I don't tell linear stories. We like to be evocative of a mood, or a theme. All of the [pieces] seem to tie into relationships—either with ourselves, our loved ones, our friends, or our family. The first half of the piece is playing on the happy side, and in the middle it takes a little bit of a dark turn. Elliott talks a lot—as we all do—about weather. I mean, in Portland it's always an element in our lives. There's this darkness and heaviness in the air for most of the year. So, there's this element [in the piece] of suppression, and that's sort of the dark thing. We have done duets for so many years. They're always about love and support, and this time we decided we'd explore some different themes in our work. It's a little bit darker, and it's a little bit about loss; letting go of something, a loved one, or a period of your life. What was your inspiration for using a live band? DK: We were talking to our band director, Galen Clark, about a year a half ago, and it came up that we have all these connections to Elliott and his music, and he [Galen] got so excited. He said, “If you ever want to do a piece with Elliott Smith's music, I'd love to be involved. He's my favorite.” He arranged all the music. It's definitely not a cover band, or a tribute sort-of-thing. It has a lot softer and jazzier feel to it, which is Galen's interpretation of the music. You've been dancing together for decades. Do you find it easier to choreograph together given that experience? DK: Yeah, I mean, we think a lot alike. Even when we do other people’s movements, we’ll just move the same by default. You just start to have this collective mind, and you start to be able to understand each other without really discussing it. ES: We just know how each other dances having danced together for so many years. What changes in the city's arts scene have you noticed during your tenure here? 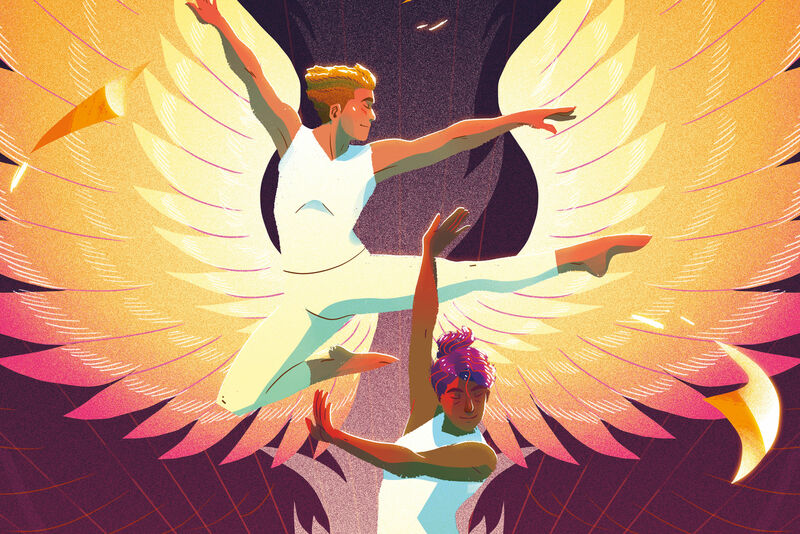 ES: When I moved here [in 1987] there were two ballet companies [Ballet Oregon and Pacific Ballet Theatre]... there was a lot of modern dance happening, but there was not a lot of cohesiveness. Then the ballet companies merged [to form OBT], so that was a huge change. 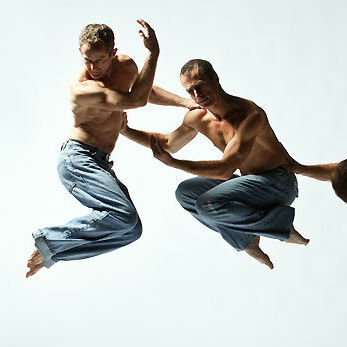 Then Conduit started, which became a big booster for the modern dance scene. And White Bird started—pretty much at the same time as BodyVox—and Polaris came along, then Northwest Dance Project came along... There's a lot of dance happening. DK: I travel a ton for my work, and when I tell people I'm from Portland they say, “Oh, that's such a great town to dance in. I'd love to dance there.” I mean, [it seems] every dancer wants to move here. It's known as a very strong dance community throughout the country. Watch Polaris and BodyVox Practice!